After the Great War had ended, the 1st battalion re-formed and went to Ireland, where six men were killed and seventeen wounded during the political struggle. They moved to Aldershot in 1924 and then to Dover in 1927. In 1930, the battalion left England for Gibraltar, the first posting of an overseas tour. The 2nd battalion left for India in 1919 and their ship called at Gibraltar on their way home in 1930. The 1st and 2nd battalions had fought side by side during the latter stages of the Great War, but this was the first time the two battalions had met in peace-time since 1895. The bands of the two battalions led a march, there was a football match and drinks in the Officers' and Sergeants' Messes. On arrival in England, the 2nd Lincolns were also based at Dover until they moved to Catterick in 1933. Both battalions were to see action in the 1930s. In 1931 the 1st battalion moved from Gibraltar to Shanghai, China, where there was an International Settlement to protect the lives and property of foreigners living and working there. Hostilities broke out when a Chinese military group came into conflict with a Japanese naval party. Shells and bombs frequently dropped in the Settlement and one which exploded 30 yards from the Orderly Room blew the CO out of his chair. The 1st Lincolns left Shanghai for the more peaceful posting of Hong Kong in September 1932. They stayed there for 3 years and then moved to India. They were there when the Second World War broke out. 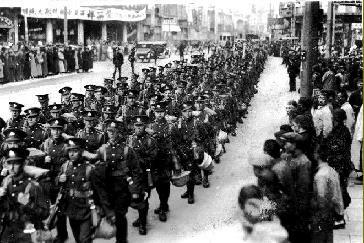 The 1st battalion march along Nanking Road, Shanghai. 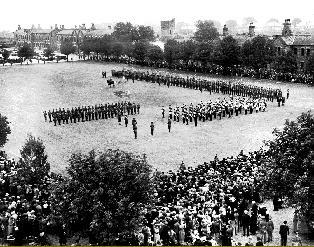 The 2nd battalion Troops the Colour at the depot in 1935 to celebrate the 250th anniversary of the formation of the regiment in 1685. A large number of people from across the county came to watch the ceremony. In 1935, Mussolini was seeking to extend the Italian Empire in North Africa and the 2nd battalion was sent at very short notice to Malta. They arrived two days after the Italians moved into Abyssinia. The 2nd Lincolns spent a pleasant winter in Malta, the Italians captured the Abyssinian capital, Addis Ababa, the weak League of Nations lifted sanctions and life returned to normal. But instead of returning home, the 2nd battalion was sent to Palestine where the Arabs had called a General Strike because of the immigration of Jews. The 2nd Lincolns were stationed at a small town halfway between Haifa and Tel Aviv. The Arabs were sabotaging the railway line and sniping at traffic, and the Lincolns were given the job of escorting the convoy which ran daily between the two towns and keeping the surrounding hills clear of Arabs lying in ambush. They were supported by some armoured cars of the 11th Hussars and a pom-pom detachment from HMS Sussex, mounted on lorries. 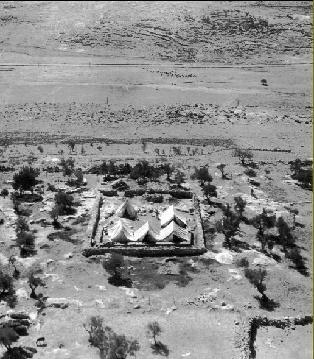 Outposts were established for each platoon in the hills. There was a pitched battle with the Arabs in September, but the Strike ended in October and the 2nd battalion returned home in time for Christmas. In October 1937 the battalion moved to Portland Bill and were there when WW2 started. between Haifa and Tel Aviv can just be made out, running from left to right near the top of the picture. 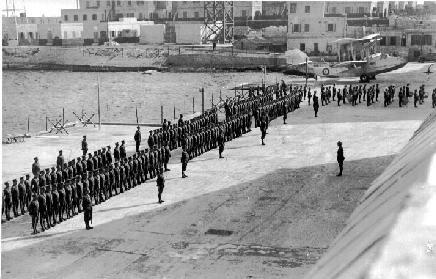 The 2nd battalion arrives at Malta. A Supermarine Walrus can be seen in the background. 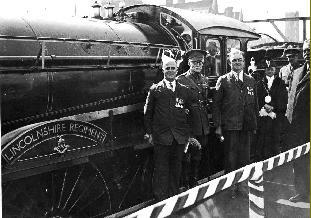 The band and a Guard of Honour from the 2nd battalion took part in a ceremony at Lincoln's LNER station when a locomotive was named "The Lincolnshire Regiment". The driver and the fireman both served in the regiment throughout the Great War. 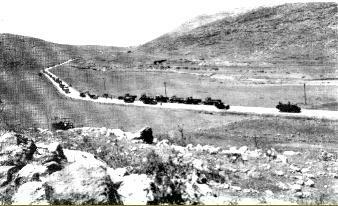 A convoy on the road between Haifa and Tel Aviv.